The church that cost $15,000 to build in the late 1850s now will cost more than $2 million to save. 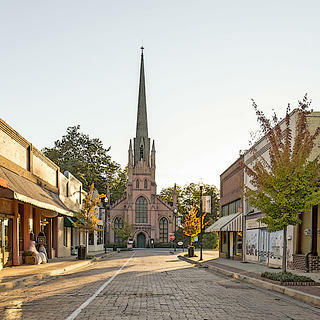 There are no big moneyed donors in Abbeville, South Carolina, but there is an aging church community at Trinity Episcopal Church with a deep appreciation of the past and the faith to search for the funds. “Our congregation is so old that all our acolytes draw Social Security,” the church historian May Hutchinson tells me. 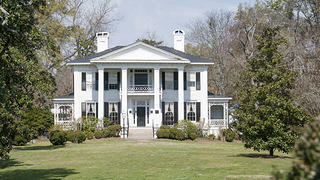 I laugh, the sound echoing off of the now water-stained walls that were first raised in 1858-1860. Better preserved is the church’s inventory of rare 19th-century stained glass. For years it was thought the chancel window was of English origin and, given the timing of the Civil War, run through the Union blockade of Charleston Harbor, a charming story that has now been discounted. Experts now attribute the chancel window to the New York Studio of William Gibson, considered to be the "father of stained glass painting in America." 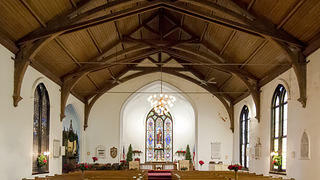 Trinity Episcopal Church was consecrated on November 4, 1860. On November 22, possibly the first organized mass meeting for secession from the Union was held in the city. A month after the rally, 169 delegates at a state convention in Charleston unanimously approved South Carolina's secession. Spirits were high, but at war’s end the South was in ruins and many of its men dead. The town, and its most-recognized church, never fully recovered from the devastating effects of the war. In 1930, the distinctive pink-colored church closed and did not reopen until 1949. Its future is now in the hands of a few determined souls who believe the work of preservation is important and that it can be done. The town's most famous citizen, John C. Calhoun—who along with Daniel Webster, Henry Clay, and Andrew Jackson, dominated American political life from 1815 to 1850—died a few years before the new church was built. Confederate general Sam McGowan later attended the church. The altar is the original, and was returned to the church after a long and mysterious absence in 1979. 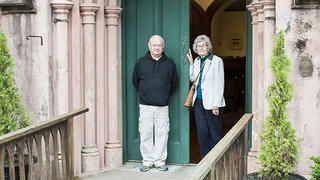 Church warden Lewis Ashley and church historian May Hutchinson stand at the doors of the church. On May 2, 1865, weeks after General Robert E. Lee had surrendered at Appomattox, Confederate president Jefferson Davis, still thinking the war could be won, held his final war planning meeting at Abbeville's Burt-Stark Mansion, a few blocks away from Trinity Episcopal Church. On May 10, Davis would be captured by Union troops in Georgia, thus ending his infamous "flight from Richmond." 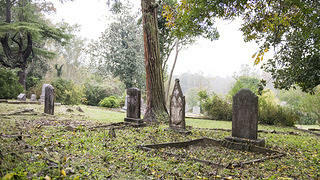 Veterans of Confederate service are buried in the Trinity Episcopal Cemetery. Surprisingly, one Union soldier is also buried here. Bill Fitzpatrick shares the story of the Lower Long Cane ARP Church and the small congregation that preserves its history. Discover Kahal Kadosh Beth Elohim (KKBE) Congregation, the second oldest synagogue building in the United States.